I was born and raised in Belarus, a small European country. My cultural roots are very connected to the land and the food and to wild crafting and to that sort of active participation with life — in terms of being able to make things, being able to repurpose things, being able to really see the creative potential in anything that is manmade.I'm a child of two engineers, but I was raised by my grandmother, who was sort of the archetypal grandmother of wonderful food and warm home. She made all of our clothes and cooked and canned and just really did everything. She kept the whole household going. That heritage for me created a very creative blend of arts and sciences. I'm really attuned to both aspects of life and equally at ease with both creative and more organized aspects of life. I'm really activated and excited when I see substances that are living or could be brought to life, so whether it is fabric or wool or plants, seeds, harvest, and soil. That's really where I come alive, and that's where I really begin to share my inspiration with other people. 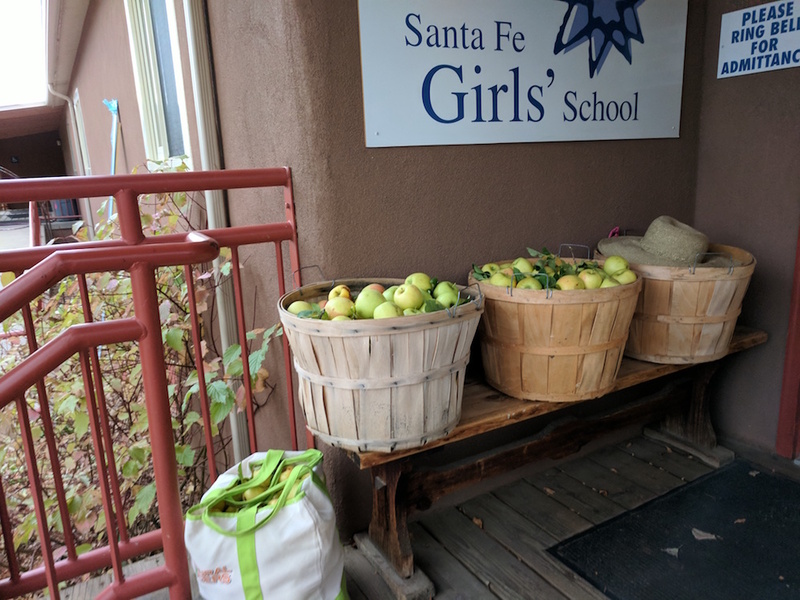 So it was natural for me to invest that inspiration into the TerraGirls after-school program for middle-school girls at the Santa Fe Girls' School, where I work. We meet twice a week, to work with the inspiration of the seasons, with land-based creativity, weaving in the garden work, making food, finding songs, doing art and handwork. We are lucky to have this tiny delicious school garden, a very simple outdoor kitchen under a grove of fruit trees, and a very lovely and cozy greenhouse with a place for art projects, journaling, and sewing. There is a tea party every day, and then it is time for our projects. Everything is slow and deliberate, girls are learning to really invest their time and care into things we work with. You can't just race through it. The moment they are outdoors, the moment they are touching the ground, there is this incredible invigoration of all of the senses and piquing of curiosity, and an engagement of the will. This fall, we harvested apples from an old apple tree, planted 40 years ago to celebrate a birth of a first daughter. She herself is a mother now, her tree filled with golden fruit, just glowing with golden apples. After the harvest, the girls and I made apple juice with a large heavy-duty apple press. It took a lot of time, first to wash three bushels of apples, and then the girls had to grind the apples while singing to keep the movement rhythmical and smooth, then crank the press by hand, tightening it until the golden juice started pouring into jars. That takes time and a lot of apples to make, but it's so delicious and it makes you want to sing when you try it. There is that whole new sense now of looking at that apple juice in the store and realizing, what does it take to produce that apple juice and what did it take to produce the apple juice we made? Is it the same substance? I don't ask them those questions; I let them think about all of this on their own. I'm so delighted to show the girls the food connections that they might not otherwise witness. To make herbal teas, we planted the tea garden first. When we made infused vinegars, we went to the garden for our ingredients. What I am trying to create is not just the view of food that you go to a boutique store and buy your ingredients and then combine in them in a bountiful way and stimulate your senses and it's delightful. I'm trying to give them the deeper connection that there is work involved. And the work itself is pleasing — the planting, the harvesting, the participating in the web of life. It is in the work where the senses are delighted, and the work is creative and life-affirming. Everything TerraGirls work with is either grown or harvested or produced by girls; it is grounded in work. My students have the power to infuse the world with joy and positivity. We live in a world that brings a lot of sadness and criticism in everyone that engages in the conversation about it, on every level. So, my goal is to implicitly be able to give students that sense that they can participate in this world and shape it. In this case, it's not in a political sense, not in explicit activism, but almost in a sense of how they view things and how they view what's alive and what is a product of human ingenuity and how they participate in all of this in a productive way. That is restorative, life-affirming. To me, that loving intention, when it is put at the base of all their actions, that has a tremendous potential. Again, it's not explicit; I don't talk to them about it. It's implicit. I want them to encounter things with that attitude in life. There is a sense of familiarity, a sense of care, and a sense of love. That loving care toward the world is soul food. In the fall, girls make cold season remedies and take them home. They know the recipe by heart, having worked with herbs and spices. They begin as a child, a learner, and then they turn into healers: They bring a relief and care to someone who is sick. It starts at home and hopefully grows into the larger community. I like the idea of taking the students through the entire year ... garden, harvest, putting things to sleep, and in the winter getting engaged with baking, working with fibers, greeting spring with singing and starting seeds in our greenhouse. The natural world is asleep, but you continue to interact with the gifts or products of that world, that season. In the winter months we focus on giving warmth, and by that I mean, in a broader sense, giving love and care and concern for other people: knitting warm things, baking bread, dipping beeswax candles that will light the family's dinner table, igniting a heartfelt conversation. At first, it's hard for me to see if the girls are interested or not, but then it comes: They are hungry to be makers. They just can't get enough. It's beautiful. Last year, when we were going to plant some seeds in the garden, I thought, "OK, here are the seeds; here is the garden; we're going to plant the seeds." When girls saw the garden, they didn't even think about the seeds; they saw the soil first. They started jumping up and down and saying, "We're going to dig! We're going to dig! We're going to dig!" These were sixth and seventh graders, and they rejoiced in the feeling of handling living soil, in looking at garden bugs, and in literally getting grounded in that connection. Their parents later shared with me that the girls come home more relaxed than ever, restored and filled with satisfactions of work well done — and that feeling helped them along in their school work. I am giving the girls this taste of their own ability to find restorative and positive engagements, the kinds that take them from self-care into care for the world. Our work as TerraGirls, whether it is sewing, baking, planting, singing, spinning wool to make a hat for someone's new baby, is filled with love and with care for the world. And that is the soul food. Arina combines over 15 years of experience managing educational non-profit organizations with a focus on education, sustainable living skills and permaculture. She is a designer, educator, homesteader, gardener, writer, radical homemaker, and community organizer. She lives with her family on a lovely permaculture farm in Pojoaque, NM, and teaches at the Santa Fe Girls' school and its TerraGirls After-School Program.